Accommodation | DGP - Deutsche Gesellschaft für Pflegewissenschaft e.V. Accommodation at the venue hotel can be booked via the online registration for the congress. 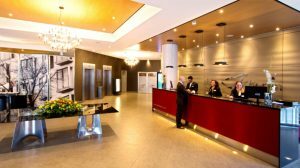 The abba Berlin hotel is a 4-star hotel featuring contemporary design with 214 bright and spacious rooms in various categories, adhering to the highest standards in comfort. It offers his conference guests varied and top-quality breakfast and lunchtime buffets, not to mention healthy, sweet and tasty treats during the coffee breaks. Furthermore you can look forward to the facilities of the excellent abba mía restaurant as well as those of the stylish lounge bar. Public high-speed Wi-Fi and the fitness and wellness area can also be used free of charge by his guests. Staying in abba Berlin hotel you will find yourself in the midst of things: the world-famous Ku’damm boulevard, the Kaiser Wilhelm Memorial Church, the KaDeWe department store, Berlin Zoo, Theater des Westens (theatre for musicals and operettas) and the iconic Europacenter mall are practically on our doorstep. There are also excellent connections to the autobahn, Berlin’s Tegel and Schönefeld airports, all main-line railway stations as well as the Berlin exhibition grounds, the Olympic Stadium and the Waldbühne open-air concert venue. The convention team will advise you on an individual basis, to help make your event a complete success. For further accomodations please visit the official website of Berlin.